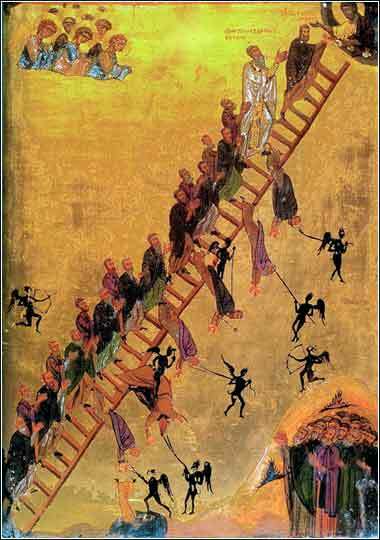 The Ladder of Divine Ascent (Jacob's Ladder), 12th century, St. Catherine's Monastery, Mount Sinai, Egypt. "The golden rule for understanding in spiritual matters is not intellect, but obedience." The sons of Israel did so: and Joseph gave them wagons, according to the command of Pharaoh, and gave them provisions for the journey. To each and all of them he gave a change of clothes, but to Benjamin he gave three hundred shekels of silver and five changes of clothes. . . . So they went up out of Egypt and came to the land of Canaan to their father Jacob. And they told him, “Joseph is still alive, and he is ruler over all the land of Egypt.” And his heart became numb, for he did not believe them. Then Jacob set out from Beersheba. The sons of Israel carried Jacob their father, their little ones, and their wives, in the wagons that Pharaoh had sent to carry him. They also took their livestock and their goods, which they had gained in the land of Canaan, and came into Egypt, Jacob and all his offspring with him, his sons, and his sons' sons with him, his daughters, and his sons' daughters. All his offspring he brought with him into Egypt. So God's great miracle, still with us today, takes a great step forward. Jacob has been out of sorts because of the loss of the two sons he had had with the wife of his heart, Rachel: first the death of Joseph and then, almost fifteen years later, the apparent loss of Benjamin. He has become depressed, and his will to live seems to have left him. His focus on his role as the patriarch of the people of God also seems to have receded. And so, just as Jacob's life hits its low point and he is resigned to die unhappy, a miracle occurs. His ten other sons come home, bearing not just food to keep them alive, but wagons filled with riches, and Benjamin, and news that his lost son Joseph is not simply alive, but is also one of the most powerful men in Egypt! But Jacob cares nothing for the power or wealth. "It is enough," he say, that Joseph lives. Jacob will go and see his beloved son before he dies; it is all he wants. Beersheba, remember (if you were with us when we studied Abraham and Isaac, or know the story) is at the very edge of the Negev Desert, a sort of "last gas for 200 miles" place. It is truly a terrible and desolate desert to the west, across the Sinai Peninsula; although it is not the magnitude of the Sahara or Kalahari, crossing it is a major (and risky) undertaking. But God appears to Jacob, to give him strength, and to reaffirm His promises to Abraham (Genesis 15:13-14) (This is called "theophany" in theological circles, when God makes a direct appearance to a human.) So Jacob gambles all; this is not a trip, but rather, a migration. Almost everyone feels some reluctance to commit their heart completely to God. The actions of Jacob are suitable for some thought by all of us, for he commits not only his life, but all of his children and grandchildren, and all that they own, to march into a deadly wasteland, based solely on their faith. How easy and tempting it is for us to retain comfortable habits of thought and action, knowing that we could do better. And age is no excuse; Jacob is quite old by now.